Do You Need To Fast Before Your Cholesterol Test? When the skeptical cardiologist trained in medicine and cardiology in the 1980s the standard protocol for obtaining a lipid profile (LDL and HDL cholesterol plus triglycerides) involved having the patient fast for >8 hours before the blood was drawn. Beginning in 2009, however, various national organizations began recommending the use of nonfasting lipid profiles. In 2011 the American Heart Association endorsed the fasting lipid profile and shortly thereafter I began telling my patients they did not need to fast for these tests. Old habits and ideas are hard to kill and to this day most of my patients think that fasting is a requirement. Lab personnel seem to be stuck in the past as well and I typically instruct my patients to lie if they are asked if they have eaten. 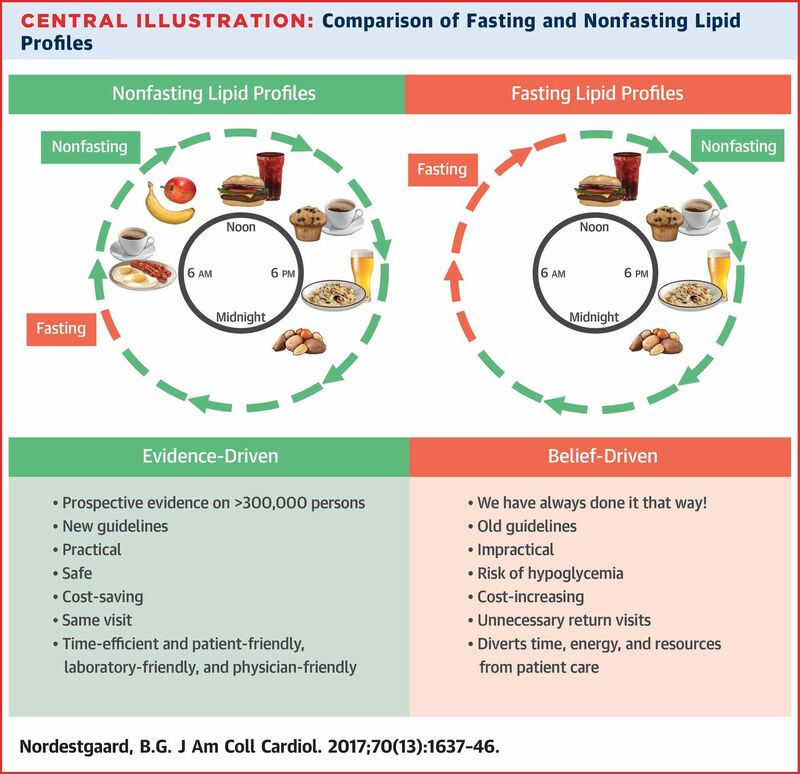 A recent JACC article makes powerful arguments for using non fasting lipid profiles. Rather than go through it in detail I’m going to post the “central illustration” which summarizes the authors points in graphic form. The nonfasting profile is “evidence-driven” and also is time-efficient, patient, laboratory and physician-friendly. To other patients whose physicians are still requiring fasting before a lipid profile I recommend challenging your doctor’s rationale. If that doesn’t work, print out a copy of the above infographic and politely ask them to read the associated paper. Excellent post and website! It is funny you tell your patients to lie because I have been lying when I get my lipids drawn. I love the infographic. Dr. P – have you ever done a post on medium-intensity statin vs. high-intensity statin? I am 36 years old and was just diagnosed with familial hypercholestermia since my LDL-C was 194. I tolerate 40 mg of pravastatin very well and got my LDL-C down to 100. However, my doc wants me to try Crestor. I’m just not sure if there is any clear-cut benefit from switching from a statin I tolerate extremely well to one I may not. Thanks!